EZCA for P3D 4.5 here !!! I uninstalled then installed everything again... .53 install then updated 62..63..65. Strangley without doiing anything different, EZCA starts, restarts, closes, restarts closes several times then when the scenario opens again. Then I have to manually start EZCA once the plane and scenario have loaded just to get cameras. AS16 is grayed out too! Yes & Yes to both. 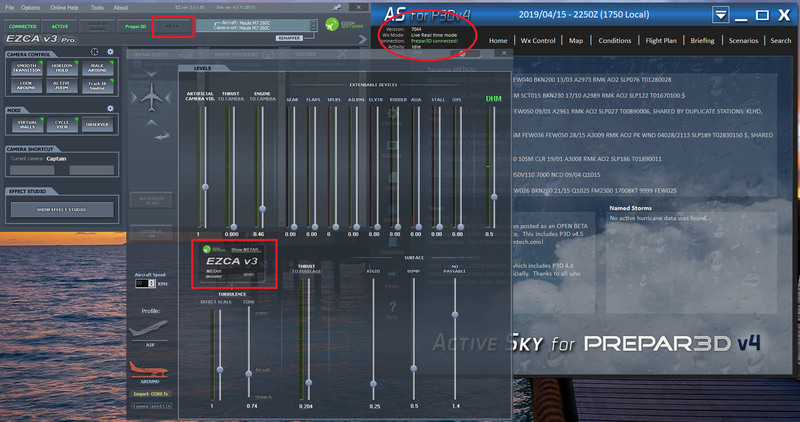 I have noticed when loading P3D v4.5 without Active sky and ASCA, EZCA does attempt to load several times. as previously then it runs no problems when I manual load again in the scenario. Is this something to consider when loading P3D? I am still on P3D v4.4 but for me, when I start P3D, the EZCA Launcher pops into the taskbar and then goes away, but only once. If you are running full screen, try setting window mode in P3D, shut down and try again. Also, double-check the exe.xml file. Another option is to disable any other entries (Disabled=True) so that only EZCA is launched via exe.xml. You can also set Manual Load to True and it will prompt you to run any enabled programs in there. There's not much more I can think of, other than what I previously mentioned. Edit: I must have been thinking of FSX as P3D v4 Full Screen is actually a borderless window so will not make any difference. You got Ezdok installed now. Can you post a short video of what you are seeing? Then I will try the same in P3Dv4.5. I have the some problem with EZCA launching, and I can launch manually EZCA after the game started. 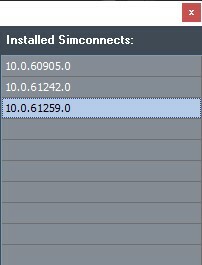 Try set an older version simconnect in the advanced menu. Same here, AS16 is greyed out confirmed as well. I bought and installed "Chase Plane" !!!! I am creating cameras ! I wish I had done that too! At least I'd have cameras in chase plane. I own both Ezca 2 and 3 and nothing works for P3d v4.5. Start up with EZCA .65 seems sporadic. I've tried all day to replicate what I saw yesterday only for EZCA to sit showing Connecting with simconnect... message for ages! I am going to request a refund from flight1 and go down the chase plane route I guess too! Looks like your EZCA.exe blocked by antivirus software or Windows defender. Try to add it to exclussions and run with admin rights. After updating ezca 3.0.1.65, I can not communication between EZCA and ASP4. ASP4 is updated with build 7035. The active sky turbulence module does not work. Already doing internal tests build 3.0.1.66. Fixed compatibility with the last "beta" ActiveSkyP4 (7035). We'll probably publish it tomorrow. Anyway, EZCA is still unable to recognize ActiveSky. PLEASE ENSURE it is compatible with Active Sky B7044. Does Ezdok need to be updated every time ActiveSky releases a new Beta version during their testing period? An update is required only if ActiveSky is modified along with a DLL that provides weather data. Tonight there will be a fresh build 3.0.1.66 compatible with AS B7044. Also in the evening there will be a release version of EZCA 2.8 compatible with P3D 4.5 and the latest AS B7044. "An update is required only if ActiveSky is modified along with a DLL that provides weather data." How do users know when that happens? How to verify? Which dll is it (as an example)?